Perfect weather, keen clients and a week of tracking. What more can a Woodlore instructor ask for? The course season has been flying by so far with plenty of happy clients and great weather. The ‘T-Shirt tans’ of the outdoor team are coming along nicely as well! 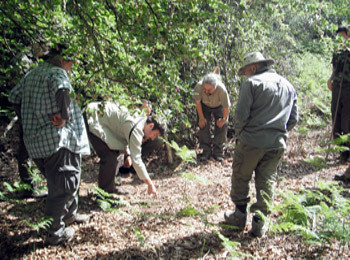 This week sees our first Woodsense tracking course of 2011. Tracking is one of the most important skills in the subject of bushcraft and is not, as many would have you believe, some black voodoo art. Neither do you have to have been raised by wolves to get to grips with the skill. We hardly ever follow a ‘Man Friday’ set of footprints in soft sand but look for more subtle sign – something out of the ordinary in the environment in which we’re working. If you walked into your living room at home and saw the T.V. remote wasn’t in its usual place on the armchair but on the coffee table you would notice. It’s exactly the same principle. Aside from being a great challenge and extremely addictive, tracking can only enhance our enjoyment, observation and skills when we are in the outdoors; we notice the deer flicking its tail, the spiney oak up in the canopy and the edible fungi before anyone else. However, the best thing about tracking is its accessibility. You need only two things: time spent outdoors and your eyes. Those of you who track will understand my enthusiasm. Those who have never tried it trust me; get outside, switch on, take your time and enjoy. Your time in the woods will never be the same again. N.B. 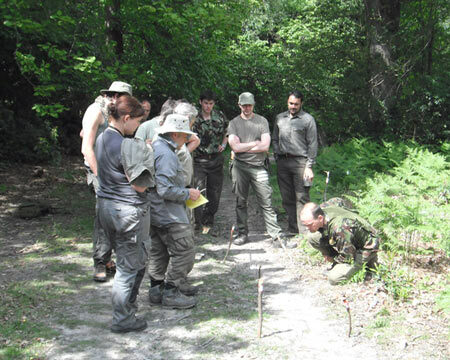 Please note, that from 2012 onwards the Woodsense course will be re-named the Woodlore Tracking course. This entry was posted in The Woodlore Team on May 24, 2011 by Woodlore Team. Tolerating a numb bum, ignoring mozzie’s biting, refusing to acknowledge binocular holding arms burning…all essential skills acquired for a wonderful wildlife encounter..watching a fox ‘voling’ and snapping at flies less than 4 metres in front of me- oblivious to my presence. Just one of the burned into my memory experiences I encountered last week on the excellent Woodsense course. Oh and not forgetting the blood, sweat and (happy) tears of the last days antics…..intrigued? Don’t dilly dally, hone your senses and sign up now for the next course in August. I can’t recommend it enough. Tracking is one of the most rewarding skills, I told this story before but one evening ( 5pm to 10 pm ) i was tracking a group of Deer for about 4 hours. I thought i had lost them but then all of a sudden i heard a twig snap. I hit the deck hard ( lol ) and what would you know looked up and there where 8 Deer grazing, Magical!